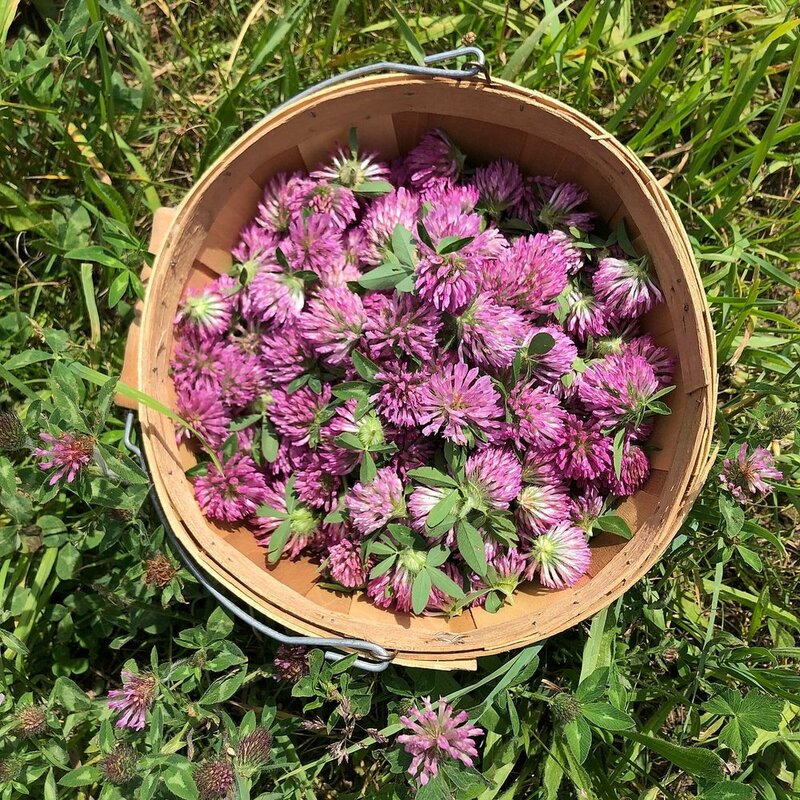 The Muddy River Herbals CSA offers biweekly shares of medicinal and culinary herbs from mid-June through the end of October. All of our shares involve ten weekend pickups consisting of fresh, and occasionally dried, herbs grown with love on the farm. Members will also find occasional wildcrafted (sustainability foraged) offerings such as plantain, dandelion, and violets. September farm tour (featuring herbal drinks and treats), where you’ll be able to meet and mingle with your fellow CSA members and herb lovers. Digital newsletter sent out on pickup day, featuring recipes and field notes. And, of course, access to healthy, fresh, and nourishing herbs grown by farmers you know (or will know soon!). This share is tailored to herbalists who use a variety of different herbs in their work with clients, friends, and families (as well as themselves!). Members buying into this share will receive five bunches of herbs at each pickup, and can customize their order based on the week's availability (which will be sent out on the Sunday prior to pickup). For example, a member could choose to receive up to five different herbs in their share, or five bunches worth of one herb. Members can also choose to receive a 4” seedling in place of one bunch. The student share is designed for students of botanical medicine who are looking to deepen their knowledge of medicinal herbs. This can also provide a variety of culinary herbs for those wishing to explore the wide flavor possibilities of the roots, shoots, and leaves of the year's bounty. Each share will contain three bunches of herbs which can be customized based on field availability (see customization options in herbalist share, above). Our family share is for people interested in learning more about how herbs can be used to enhance their health and wellness and that of their loved ones (including kids). Each pickup day members of this share will receive one bunch of herbs which we have chosen for its ease of use, as well as an illustrated plant profile (sent digitally) with detailed instructions on how to use the plant. This year we are introducing our Culinary Share option. Similar to the Family Share, we are offering one large bunch (or several smaller bunches eg. Basil Medley or Mint Medley) of delicious herbs. Each share will likewise be accompanied by an illustrated digital plant profile with usage ideas and recipes to guide your exploration of herbs in the kitchen. We have a workshare for those wanting to volunteer their time in exchange for a student share. Because we know that our share members have a wide variety of talents and schedules we will work with you directly to figure out how to best utilize your yours. We generally ask that workshare members donate one to four hours of their time per week for a total of at least 20 hours throughout the course of the season. Workshare members should be able to lift and carry 35 pounds, be able to work on their feet for hours at a time, and have or be able to arrange reliable transportation to the farm. Around the beginning of the season, we will contact you to schedule work on the farm. Once a time is set up, we ask that you honor the scheduled time(s) and date(s) as we will be relying on you to work at that time. If you are forced to reschedule, as much warning as possible is much appreciated. For more information on setting up your work share, please send us an email with "workshare" in the subject line. Spaces are very limited, so please get in touch early! We are incredibly grateful to the generous people at HERBSTALK for providing two scholarships for our 2019 Medicinal Herb CSA! These scholarships are here to help those for whom the purchase of a CSA would be a substantial financial burden. Recipients will become share members at the student level, meaning that they will receive three bunches of herbs at each pickup throughout the growing season. Before applying please read through the information provided on this page about our CSA as well as our member agreement. Please note that by applying for this scholarship you are committing to being able to get your herbs on all ten pickup dates during the growing season. Applications will close on March 7th and recipients will be chosen by March 15th. Please spread the word and click here to apply! We will be harvesting dozens of herbs for inclusion in the CSA, from arnica to za’atar. If you have any plant requests or questions about what we're growing please call or shoot us an email. ONE Thursday a month (members will receive two shares per pickup) from 2 to 6 pm. Dates TBA. We are looking forward to working with our CSA members to make this a meaningful, memorable, and beautiful growing season! Matt with a bushel of wildcrafted September Goldenrod. Jenny with a bushel’s worth of summer abundance. Clockwise from 9 o’clock: Russian Comfrey, Narrow-leaf Plantain, California Poppy, Borage, Kapoor Tulsi, Calendula, Mountain Mint, and Hyssop. Honeybee enjoying the nectar of French Thyme. A sunny patch of California Poppy. A basket full of wildcrafted Mullein, Dandelion. and Violet leaves and flowers. Edible flowers: Nasturtium, Borage, and Pansy. CSA member Marianne with a Lavender bouquet. Jenny, Matt, and a few of our CSA members at the 2016 farm potluck. NATIONAL HOLIDAY 👸🏾 Forever grateful for The Queen who never stops showing us how to do #therealwork. Happy #Beyday!! Today on Instagram. Follow the farm at @muddyriverherbals. Sign up with your email address to receive news and updates about the farm.